Some say that our industry is 10 years behind others in terms of technology adoption. 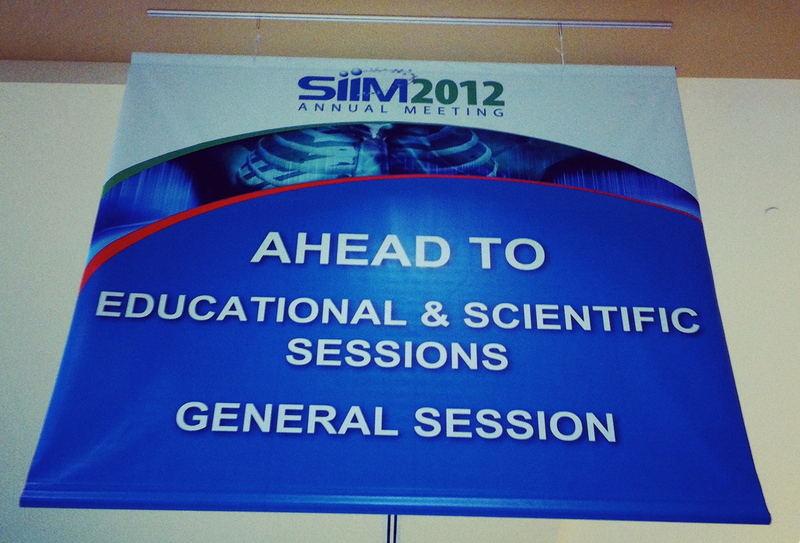 However, after the first day at SIIM 2012, it seems to me that it is not necessarily the case. Yes, the general opening session Q&A could have been a live, Twitter-based format, rather than via fast and furious test messaging. And some argue that we need WiFi-enabled conference rooms to be as connected as we think we should be. But the reality is that some health care providers are already far down the path of the “future” that was portrayed in the opening session. Using social media for live brain surgery training? Leveraging crowdsourcing to select new technology, thus empowering the eventual users? This is innovation! The medical imaging community has already begun exploiting the benefits of connectivity. The same can be said for mobile medical imaging diagnostic and viewing solutions. Clinicians and solution providers are embracing a wide range of mobile devices, for which they are pioneering an extensive variety of innovative approaches. The Imaging and Informatics community is already using leading-edge technology to transform and improve the physician and patient experience. The future is already here, and it only promises to get more interesting! Kudos to Safwan S. Halabi MD, Henri Ford Sytems and Carl Miller, MD, Johns Hopkins Medical Institutions for their inspiring presentations.